This article is about the performer. 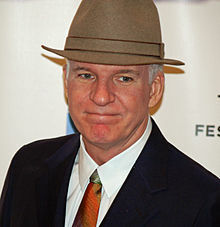 For other people named Steve Martin, see Steve Martin (disambiguation). Stephen Glenn Martin (born August 14, 1945) is an American actor, comedian, writer, producer, and musician. Martin came to public notice in the 1960s as a writer for The Smothers Brothers Comedy Hour, and later as a frequent guest on The Tonight Show. In the 1970s, Martin performed his offbeat, absurdist comedy routines before packed houses on national tours. Since the 1980s, having branched away from comedy, Martin has become a successful actor, as well as an author, playwright, pianist, and banjo player, eventually earning him Emmy, Grammy, and American Comedy awards, among other honors. Martin was raised in Inglewood, California, with brother Fred and sister Melinda Martin, and then later in Garden Grove, California, in a Baptist family. Martin was a cheerleader of Garden Grove High School. One of his earliest memories is of seeing his father, as an extra, serving drinks onstage at the Call Board Theatre on Melrose Place. During World War II, in the United Kingdom, Martin's father had appeared in a production of Our Town with Raymond Massey. Expressing his affection through gifts, like cars and bikes, Martin's father was stern, and not emotionally open to his son. He was proud but critical, with Martin later recalling that in his teens his feelings for his father were mostly ones of hatred. Martin's first job was at Disneyland, selling guidebooks on weekends and full-time during his school's summer break. That lasted for three years (1955–1958). During his free time, he frequented the Main Street Magic shop, where tricks were demonstrated to patrons. While working at Disneyland, he was captured in the background of the home movie that was made into the short-subject film Disneyland Dream, incidentally becoming his first film appearance. By 1960, he had mastered several magic tricks and illusions and took a paying job at the Magic shop in Fantasyland in August. There he perfected his talents for magic, juggling, and creating balloon animals in the manner of mentor Wally Boag, frequently performing for tips. In his authorized biography, close friend Morris Walker suggests that Martin could "be described most accurately as an agnostic ... he rarely went to church and was never involved in organized religion of his own volition". In his early 20s, Martin dated Melissa Trumbo, daughter of acclaimed novelist and screenwriter Dalton Trumbo. After high school, Martin attended Santa Ana College, taking classes in drama and English poetry. In his free time, he teamed up with friend and Garden Grove High School classmate Kathy Westmoreland to participate in comedies and other productions at the Bird Cage Theatre. He joined a comedy troupe at Knott's Berry Farm. Later, he met budding actress Stormie Sherk, and they developed comedy routines and became romantically involved. Sherk's influence caused Martin to apply to the California State University, Long Beach, for enrollment with a major in philosophy. Sherk enrolled at UCLA, about an hour's drive north, and the distance eventually caused them to lead separate lives. Inspired by his philosophy classes, Martin considered becoming a professor instead of an actor–comedian. His time at college changed his life. In 1967, Martin transferred to UCLA and switched his major to theater. While attending college, he appeared in an episode of The Dating Game. Martin began working local clubs at night, to mixed notices, and at twenty-one, he dropped out of college. During these years his roommates included comedian Gary Mule Deer and singer/guitarist Michael Johnson. Martin opened for groups such as The Nitty Gritty Dirt Band (who returned the favor by appearing in his 1980 television special All Commercials), The Carpenters, and Toto. He appeared at San Francisco's The Boarding House, among other venues. He continued to write, earning an Emmy nomination for his work on Van Dyke and Company in 1976. In the mid-1970s, Martin made frequent appearances as a stand-up comedian on The Tonight Show Starring Johnny Carson, and on The Gong Show, HBO's On Location, The Muppet Show, and NBC's Saturday Night Live (SNL). SNL's audience jumped by a million viewers when he made guest appearances, and he was one of the show’s most successful hosts. Martin appeared on 27 Saturday Night Live shows and he guest-hosted 15 times, bested only in number of presentations by host Alec Baldwin (who has hosted 17 times as of February 2017[update]). On the show, Martin popularized the air quotes gesture, which uses four fingers to make double quote marks in the air. While on the show Martin became close with several of the cast members, including Gilda Radner. Radner died of ovarian cancer on May 20, 1989; a visibly shaken Martin hosted SNL that night and featured footage of himself and Radner together in a 1978 sketch. In the 1970s, his TV appearances led to the release of comedy albums that went platinum. The track "Excuse Me" on his first album, Let's Get Small (1977), helped establish a national catch phrase. His next album, A Wild and Crazy Guy (1978), was an even bigger success, reaching the No. 2 spot on the U.S. sales chart, selling over a million copies. "Just a wild and crazy guy" became another of Martin's known catch phrases. The album featured a character based on a series of Saturday Night Live sketches where Martin and Dan Aykroyd played the Festrunk Brothers; Yortuk and Georgi were bumbling Czechoslovak would-be playboys. The album ends with the song "King Tut", sung and written by Martin and backed by the "Toot Uncommons", members of the Nitty Gritty Dirt Band. It was later released as a single, reaching No. 17 on the U.S. charts in 1978 and selling over a million copies. The song came out during the King Tut craze that accompanied the popular traveling exhibit of the Egyptian king's tomb artifacts. Both albums won Grammys for Best Comedy Recording in 1977 and 1978, respectively. Martin performed "King Tut" on the edition of April 22, 1978, of SNL. Or: "Hello, I'm Steve Martin, and I'll be out here in a minute." In one comedy routine, used on the Comedy Is Not Pretty! album, Martin claimed that his real name was "Gern Blanston". The riff took on a life of its own. There is a Gern Blanston website, and for a time a rock band took the moniker as their name. With this kind of outstanding success, Martin's show soon required full sized stadiums for the audiences he was drawing. Concerned about his visibility in venues on such a scale, Martin began to wear a distinctive three piece white suit that became a trademark for his act. In 2016, Martin made a rare return to comedy, opening for Jerry Seinfeld. He performed a 10-minute routine before turning the stage over to Seinfeld. Later in 2016 he returned to stand-up comedy, staging a national tour with Martin Short and the Steep Canyon Rangers, which yielded a 2018 Netflix comedy special, "Steve Martin and Martin Short: An Evening You Will Forget for the Rest of Your Life." Martin had a small role in the 1972 film Another Nice Mess. His first substantial film appearance was in a short titled The Absent-Minded Waiter (1977). The seven-minute-long film, also featuring Buck Henry and Teri Garr, was written by and starred Martin. The film was nominated for an Academy Award as Best Short Film, Live Action. He made his first substantial feature film appearance in the musical Sgt. Pepper's Lonely Hearts Club Band, where he sang The Beatles' "Maxwell's Silver Hammer". In 1979, Martin starred in the comedy film The Jerk, directed by Carl Reiner, and written by Martin, Michael Elias, and Carl Gottlieb. The film was a huge success, grossing over $100 million on a budget of approximately $4 million. Stanley Kubrick met with him to discuss the possibility of Martin starring in a screwball comedy version of Traumnovelle (Kubrick later changed his approach to the material, the result of which was 1999's Eyes Wide Shut). Martin was executive producer for Domestic Life, a prime-time television series starring friend Martin Mull, and a late-night series called Twilight Theater. It emboldened Martin to try his hand at his first serious film, Pennies from Heaven (1981), based on the 1978 BBC serial by Dennis Potter. He was anxious to perform in the movie because of his desire to avoid being typecast. To prepare for that film, Martin took acting lessons from director Herbert Ross and spent months learning how to tap dance. The film was a financial failure; Martin's comment at the time was "I don't know what to blame, other than it's me and not a comedy." Martin starred in the Ron Howard film Parenthood, with Rick Moranis in 1989. He later re-teamed with Moranis in the Mafia comedy My Blue Heaven (1990). In 1991, Martin starred in and wrote L.A. Story, a romantic comedy, in which the female lead was played by his then-wife Victoria Tennant. Martin also appeared in Lawrence Kasdan's Grand Canyon, in which he played the tightly wound Hollywood film producer, Davis, who was recovering from a traumatic robbery that left him injured, which was a more serious role for him. Martin also starred in a remake of the comedy Father of the Bride in 1991 (followed by a sequel in 1995) and in the 1992 comedy Housesitter, with Goldie Hawn and Dana Delany. In 1994, he starred in A Simple Twist of Fate; a film adaptation of Silas Marner. In David Mamet's 1997 thriller The Spanish Prisoner, Martin played a darker role as a wealthy stranger who takes a suspicious interest in the work of a young businessman (Campbell Scott). He went on to star with Eddie Murphy in the 1999 comedy Bowfinger, which Martin also wrote. In 2005, Martin wrote and starred in Shopgirl, based on his own novella (2000), and starred in Cheaper by the Dozen 2. In 2006, he starred in the box office hit The Pink Panther, as the bumbling Inspector Clouseau. He reprised the role in 2009's The Pink Panther 2. When combined, the two films grossed over $230 million at the box office. In Baby Mama (2008), Martin played the founder of a health food company, and in It's Complicated (2009), he played opposite Meryl Streep and Alec Baldwin. In 2009, an article in The Guardian listed Martin as one of the best actors never to receive an Oscar nomination. In 2011, he appeared with Jack Black, Owen Wilson, and JoBeth Williams in the birdwatching comedy The Big Year. After a three-year hiatus, Martin returned in 2015 when he voiced a role in the animated film Home. In 2016, he played a supporting role in the war drama Billy Lynn's Long Halftime Walk. Martin's play Meteor Shower opened at San Diego's Old Globe Theatre in August 2016, and went on to Connecticut's Long Wharf Theatre later the same year. The play opened on Broadway at the Booth Theater on November 29, 2017. The cast features Amy Schumer, Laura Benanti, Jeremy Shamos and Keegan-Michael Key, with direction by Jerry Zaks. Martin wrote the story for the Disney movie Magic Camp, which will be released in 2019. Martin hosted the Academy Awards solo in 2001 and 2003, and with Alec Baldwin in 2010. In 2005, Martin co-hosted Disneyland: The First 50 Magical Years, marking the park's anniversary. Disney continued to run the show until March 2009, which now[when?] plays in the lobby of Great Moments with Mr. Lincoln. Martin first picked up the banjo when he was around 17 years of age. Martin has stated in several interviews and in his memoir, Born Standing Up, that he used to take 33 rpm bluegrass records and slow them down to 16 rpm and tune his banjo down, so the notes would sound the same. Martin was able to pick out each note and perfect his playing. Martin learned how to play the banjo with help from John McEuen, who later joined the Nitty Gritty Dirt Band. McEuen's brother later managed Martin as well as the Nitty Gritty Dirt Band. 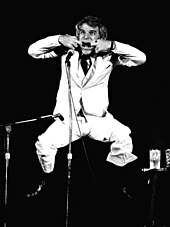 Martin did his stand-up routine opening for the band in the early 1970s. He had the band play on his hit song "King Tut", being credited as "The Toot Uncommons" (as in Tutankhamun). The banjo was a staple of Martin's 1970s stand-up career, and he periodically poked fun at his love for the instrument. On the Comedy Is Not Pretty! album, he included an all-instrumental jam, titled "Drop Thumb Medley", and played the track on his 1979 concert tour. 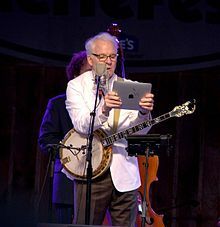 His final comedy album, The Steve Martin Brothers (1981), featured one side of Martin's typical stand-up material, with the other side featuring live performances of Steve playing banjo with a bluegrass band. Martin made his first appearance on The Grand Ole Opry on May 30, 2009. In the American Idol season eight finals, he performed alongside Michael Sarver and Megan Joy in the song "Pretty Flowers". In June, Martin played banjo along with the Steep Canyon Rangers on A Prairie Home Companion and began a two-month U.S. tour with the Rangers in September, including appearances at the Hardly Strictly Bluegrass festival, Carnegie Hall and Benaroya Hall in Seattle. In November, they went on to play at the Royal Festival Hall in London with support from Mary Black. 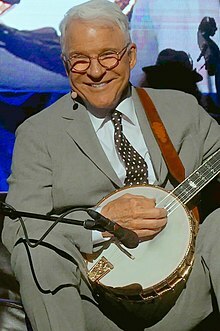 In 2010, Steve Martin and the Steep Canyon Rangers appeared at the New Orleans Jazzfest, Merlefest Bluegrass Festival in Wilkesboro, North Carolina, at Bonnaroo Music Festival, at the ROMP Bluegrass Festival in Owensboro, Kentucky, at the Red Butte Garden Concert series and on the BBC's Later... with Jools Holland. Martin performed "Jubilation Day" with the Steep Canyon Rangers on The Colbert Report on March 21, 2011, on Conan on May 3, 2011, and on BBC's The One Show on July 6, 2011. Martin performed a song he wrote called "Me and Paul Revere" in addition to two other songs on the lawn of the Capitol Building in Washington, DC, at the "Capitol Fourth Celebration" on July 4, 2011. In 2011, Martin also narrated and appeared in the PBS documentary "Give me the Banjo" chronicling the history of the banjo in America. In 2017, Martin and Brickell appeared in the multi award-winning documentary film The American Epic Sessions directed by Bernard MacMahon. Recording live direct-to-disc on the first electrical sound recording system from the 1920s, they performed a version of “The Coo Coo Bird” a traditional song that Martin learned from the 1960s folk music group The Holy Modal Rounders. The song was featured on the film soundtrack, Music from The American Epic Sessions released on June 9, 2017. In 2010, Martin created the Steve Martin Prize for Excellence in Banjo and Bluegrass, an award established to reward artistry and bring greater visibility to bluegrass performers. The prize includes a US$50,000 cash award, a bronze sculpture created by the artist Eric Fischl, and a chance to perform with Martin on Late Show with David Letterman. Recipients include Noam Pikelny of the Punch Brothers band (2010), Sammy Shelor of Lonesome River Band (2011), Mark Johnson (2012), Jens Kruger (2013), Eddie Adcock (2014), Danny Barnes (2015), Rhiannon Giddens (2016), and Scott Vestal (2017). In the late 1970s and early 1980s, Martin was in a relationship with actress/singer/dancer Bernadette Peters; they co-starred in two films, The Jerk and Pennies from Heaven, during that time. Martin married actress Victoria Tennant on November 20, 1986; they divorced in 1994. On July 28, 2007, after three years together, Martin married Anne Stringfield, a writer and former staffer for The New Yorker magazine. Former Nebraska Senator Bob Kerrey presided over the ceremony at Martin's Los Angeles home. Lorne Michaels, creator of Saturday Night Live, was best man. Several of the guests, including close friends Tom Hanks, Eugene Levy, comedian and film director Carl Reiner, and magician/actor Ricky Jay, were not informed that a wedding ceremony would take place. Instead, they were told they were invited to a party and were surprised by the nuptials. In December 2012, Martin became a father for the first time when Stringfield gave birth to a daughter. Martin has been an avid art collector since 1968, when he bought a print by the Los Angeles artist Ed Ruscha. In 2001, the Bellagio Gallery of Fine Art presented a five-month exhibit of 28 items from Martin's collection, including works by Roy Lichtenstein, Pablo Picasso, David Hockney, and Edward Hopper, among others. In 2006, he sold Hopper's Hotel Window (1955) at Sotheby's for $26.8 million. In 2015, working with two other curators, he organized a show, "The Idea of North: The Paintings of Lawren Harris", to introduce Americans to Canadian painter and Group of Seven co-founder Lawren Harris. Investigators at Berlin's state criminal police office (LKA) think that Martin was a victim of German art forger Wolfgang Beltracchi. In July 2004, Martin purchased what he believed to be a 1915 work by the German-Dutch painter Heinrich Campendonk, Landschaft mit Pferden (Landscape with Horses), from a Paris gallery for what should have been a bargain price of around €700,000 (around $850,000 at the time). Before the purchase, an expert authenticated the work and identified the painter's signature on a label attached to the back. Fifteen months later, the painting was sold at auction to a Swiss businesswoman for €500,000 – a loss of €200,000. Police believe the fake Campendonk originated from an invented art collection devised by a group of German swindlers caught in 2010. Skillfully forged paintings from this group were sold to French galleries like the one where Martin bought the forgery. Martin has had tinnitus (ringing in the ears) ever since filming a pistol-shooting scene for the film Three Amigos in 1986. He has been quoted as saying, "You just get used to it, or you go insane." ^ "Comedy Central's 100 Greatest Stand-Ups of all Time". ^ "Academy Unveils 2013 Governors Awards: Honorees Angelina Jolie, Angela Lansbury, Steve Martin, Piero Tosi". Deadline.com. Retrieved October 26, 2013. ^ Whiteley, Sandy (2002). On This Date. McGraw-Hill Professional. p. 204. ISBN 0071398279. ^ "Universal Men". Spin. SPIN Media. 15 (9): 94. September 1999. ISSN 0886-3032. ^ Morris (1999) p 2. ^ "Ancestry of Steve Martin". Wargs.com. Retrieved November 13, 2011. ^ "Top 5: Famous former male cheerleaders". The Washingtion Times. ^ a b c d e f g h i j k "Steve Martin, a Mild and Crazy Guy". Time Magazine article. November 15, 2007. Retrieved August 14, 2010. ^ Wills, Dominic. "Steve Martin – Biography". TalkTalk. Retrieved May 15, 2010. ^ Martin, Steve (February 2008). "Being Funny: How the path-breaking comedian got his act together". Smithsonian. Retrieved August 14, 2010. ^ "Steve Martin". Television Academy. ^ a b c Martin, Steve (2008). "Being Funny". Smithsonian Magazine. Archived from the original on October 14, 2009. Retrieved February 22, 2008. ^ a b Frum, David (2000). How We Got Here: The '70s. New York City: Basic Books. pp. 36–37. ISBN 0-465-04195-7. ^ "King Tut" Video on YouTube. Retrieved August 14, 2010. ^ Rabin, Nathan. "Steve Martin: The Television Stuff". Onion Inc. Retrieved December 10, 2012. ^ O'Reilly, Terry (February 8, 2018). "How A Wardrobe Change Transformed Steve Martin's Career". Under the Influence. CBC Radio One. Pirate Radio. Retrieved February 18, 2018. ^ Czajkowski, Elise (February 19, 2016). "Jerry Seinfeld and Steve Martin standup comedy review – superbly honed" – via The Guardian. ^ Chris Brummel (2010). "The Jerk". Archived from the original on September 3, 2014. Retrieved June 19, 2010. ^ "All of Me". Rotten Tomatoes. Retrieved November 13, 2011. ^ Gallo, Hank (December 15, 1988). "Steve Martin leaves stand-up comedy behind, scans horizon for next role". The Pittsburgh Press. Retrieved April 8, 2019. ^ Singer, Leigh (February 19, 2009). "Oscars: the best actors never to have been nominated". The Guardian. London. Retrieved November 13, 2011. ^ Grossman, Lev (December 9, 2007). "Born Standing Up review". Time. Retrieved November 13, 2011. ^ Maslin, Janet (November 28, 2010). "A New York Tale of Art, Money and Ambition". New York Times. Retrieved October 24, 2016. ^ Viagas, Robert (August 7, 2016). "New Steve Martin Play Meteor Shower Opens in California Tonight". Playbill. Retrieved October 24, 2016. ^ Rizzo, Frank (October 10, 2016). "Connecticut Theater Review: 'Meteor Shower' by Steve Martin". Variety. Retrieved October 24, 2016. ^ "Hosts of the 2010 (82nd) Academy Awards" Archived November 7, 2009, at the Wayback Machine. Academy of Motion Picture Arts and Sciences. ^ "Steve Martin Plays The Banjo Really Well (Video)"]. October 6, 2009. The Huffington Post. Retrieved May 15, 2010. ^ The Crow album on Martin's official website. Retrieved May 15, 2010. ^ "Steve Martin To Make Grand Ole Opry Debut". April 1, 2009. Billboard. Retrieved May 15, 2010. ^ Madison, Tjames (August 4, 2009). "Steve Martin and his banjo map fall tour" Archived August 7, 2009, at the Wayback Machine. LiveDaily.com. Retrieved on October 4, 2009. ^ Gill, Andy (November 10, 2009). "Steve Martin with The Steep Canyon Rangers, Royal Festival Hall, London". The Independent. ^ "2011 ROMP". International Bluegrass Music Museum. Archived from the original on May 2, 2009. ^ "Concerts – 2010 Outdoor Concert Series". Red Butte Garden. The University of Utah. Retrieved May 15, 2010. ^ "BBC – BBC Two Programmes – Later... with Jools Holland, Series 35, Episode 9". BBC. Retrieved May 15, 2010. ^ Tobey, Matt (March 21, 2011). "This Week on the Colbert Report: Steve Martin". Comedy Partners. Retrieved November 13, 2011. ^ Barker, Olivia (June 29, 2011). "Steve Martin's 'Paul Revere' picks away at history". USA Today. ^ "A Capitol Fourth". PBS. Retrieved July 4, 2011. ^ "PBS Give me the Banjo". PBS. Retrieved June 15, 2012. ^ Thompson, Stephen (April 14, 2013). "First Listen: Steve Martin And Edie Brickell, 'Love Has Come For You'". NPR. Retrieved April 18, 2013. ^ Bauer, Scott (April 22, 2013). "Steve Martin and Edie Brickell's 'Love Has Come For You': Collaboration A Perfect Blend of Traditional, Modern". Huffington Post. ^ "The Late Show with Stephen Colbert - CBS.com". ^ Itzkoff, Dave (April 19, 2013). "Steve Martin and Edie Brickell's 'Love Has Come For You'". The New York Times. ^ "Past Winners Search". The GRAMMYs. ^ "Steve Martin and The Steep Canyon Rangers featuring Edie Brickell Announce North American Tour". SteveMartin.com. Retrieved May 28, 2013. ^ "Steve Martin and Edie Brickell on 'Unexplored Territory' of New Album". Rolling Stone. Retrieved October 29, 2015. ^ Pearson, Vince. "Edie Brickell, Steve Martin Broadway Bound With 'Bright Star'". NPR. NPR. Retrieved December 29, 2015. ^ a b "American Epic: The Collection & The Soundtrack Out May 12th | Legacy Recordings". Legacy Recordings. April 28, 2017. Retrieved February 27, 2018. ^ Itzkoff, Dave (September 15, 2010). "Steve Martin Creates Steve Martin Bluegrass Prize". Arts Beat. New York Times. Retrieved January 24, 2013. ^ Itzkoff, Dave (September 6, 2011). "Steve Martin Honors Another Banjo Player". Arts Beat. New York Times. Retrieved January 24, 2013. ^ Itzkoff, Dave (September 20, 2012). "Steve Martin Awards Third Annual Bluegrass Prize". Arts Beat. New York Times. Retrieved January 24, 2013. ^ Itzkoff, Dave (September 11, 2013). "Steve Martin's Prize for Bluegrass Goes to Jens Kruger". New York Times. Retrieved October 1, 2013. ^ Itzkoff, Dave (September 15, 2014). "Veteran Banjo Player Wins Bluegrass Honor: The Steve Martin Prize Goes to Eddie Adcock". The New York Times. Retrieved September 22, 2014. ^ "Victoria Tennant Biography (1950?-)". FilmReference.com. Retrieved February 13, 2013. ^ a b c "Steve Martin weds girlfriend Anne Stringfield". Associated Press via USA Today. July 29, 2007. ^ "Latest News, Videos & Guest Interviews from the Today Show on NBC". ^ "Steve Martin a first-time dad at 67". New York Post. February 13, 2013. Retrieved February 13, 2013. ^ Lisa Snedeker (June 10, 2001), Las Vegas Casinos Gamble on Art as a Crowd Pleaser Los Angeles Times. ^ Carol Vogel (October 6, 2006), Edward Hopper Paintings Change at Whitney Show. The New York Times. ^ Lindsay Pollock (November 29, 2006), Steve Martin Hopper, Wistful Rockwell Break Auction Records Bloomberg. ^ "German Art Forgery Scandal Reaches Hollywood". Der Spiegel. May 30, 2011. Retrieved May 30, 2011. ^ Wallechinsky, David; Wallace, Amy (2005). The new book of lists: the original compendium of curious information. New York: Canongate. ISBN 1841957194. ^ "How to manage tinnitus". utahbesthearingaids.com. Archived from the original on October 24, 2014. Retrieved May 20, 2014. ^ a b "Steve Martin – Billboard Albums". Allmusic. Retrieved January 15, 2011. ^ "Steve Martin Album & Song Chart History". Billboard.com. Prometheus Media Group. Retrieved January 15, 2011. 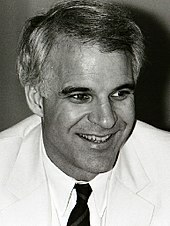 ^ a b c "RIAA – Searchable Database: Steve Martin". Recording Industry Association of America. Retrieved November 14, 2011. ^ "RIAA – Searchable Database: Lonely Hearts Club Band". Recording Industry Association of America. Retrieved November 14, 2011. ^ "Bluegrass Albums | Billboard.com". Billboard. June 13, 2009. Retrieved March 24, 2011. ^ "Rare Bird Alert". Rounder Records. March 1, 2011. Retrieved November 13, 2011. ^ "Steve Martin and the Steep Canyon Rangers Launch Tour". All Access. February 21, 2013. Retrieved February 24, 2013. ^ Edwards, Fred (August 20, 2015). "Steve Martin & Edie Brickell Announce Second Album 'So Familiar'". Billboard. Retrieved September 16, 2015. ^ Willman, Chris (September 22, 2017). "Album Review: Steve Martin and the Steep Canyon Rangers, 'The Long-Awaited Album'". Variety. Retrieved October 3, 2017. ^ "Steve Martin – Billboard Albums". AllMusic. Retrieved January 15, 2011. ^ "Future Releases on Triple A (AAA) Radio Stations". All Access Music Group. Archived from the original on March 7, 2014. ^ "CMT : Videos : Steve Martin : Jubilation Day". Country Music Television. Retrieved June 7, 2011. ^ "CMT : Videos : Steve Martin : Pretty Little One". Country Music Television. Retrieved March 19, 2014. ^ Carr, Courtney (October 22, 2015). "See Steve Martin and Edie Brickell's 'Won't Go Back' Music Video". The Boot. Retrieved November 11, 2015.